Well, not very much like elephants really. However, I believe that baby elephants have a very long gestation period (22 months on average) and what appears at the end of this period is a fairly substantial creature, so in that respect I stand by the above statement. This is the tale of one of our "babies". We are lucky enough to have had some recent success with The Siege of Vicksburg, our latest offering to an unsuspecting world - all the more gratifying as the making of this particular production had turned out to be a somewhat complicated and protracted process. It all started while we were on holiday in the USA in the spring of 1998. Following our noses around the state of Mississippi, we stopped for the night in the town of Vicksburg on the Mississippi River. As it happened our hotel was situated just across the street from the entrance to the Vicksburg National Military Park and since we were already intrigued by glimpses of what looked like oversized gravestones dotted around and about on roadside verges, we decided to have a quick look. What was intended to be a rapid drive-through, something to fill in the couple of hours between hotel check-in and supper, turned out to be the start of something big. That first tour through the Park made a magical impression. It was late in the day and the tourist traffic had thinned to a trickle, allowing the peace and serenity of the place to reassert itself. The light seemed to mellow as the sun faded, sending deep shadows across the switchback landscape and the old siege lines and etching dramatic highlights on statues and monuments. 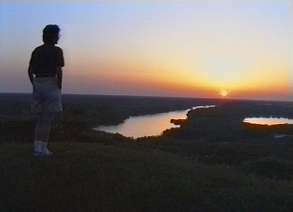 Towards the end of the drive we stood for a while on the summit of Fort Hill, high above the dark waters of the Mississippi, and watched the setting sun descend into the river in a baking red glow. If a place can speak, this one did - and it had an inspiring tale to tell. 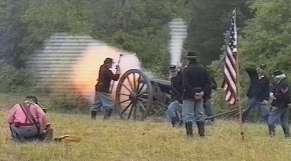 Instead of moving on from Vicksburg as we had planned, we stayed on for four days, spending the whole time in the Park filming what we saw around us and finding out what we could about the story of the siege. There wasn't even time to take a decent lunch break; we snacked on fruit, biscuits and tinned drinks - if we remembered to throw them into the boot of the car as we set out each morning. We might have stayed even longer but we were finally driven from Vicksburg by violent spring storms which brought in torrential rain and tornadoes, forcing us to retreat southwards to the Gulf coast in search of warmer, sunnier and safer weather. Back home again in England, we got down to the task of trying to sort out all the material we had gathered at Vicksburg. It gave us headaches. Research had revealed that the story of the siege was an unwieldy and complex subject. There was so much to tell and we didn't know where to begin. Our priority was to try to bear in mind what should be the golden rule of all film-makers: do not assume that your audience will be as fascinated by your subject and all its minutiae as you are. Ergo: pare it all down and slice out ruthlessly whatever is superfluous. And so we did, agonising the winter away, cutting out chunks of this and clods of that, trying to concentrate on the essential facts and most interesting background details, all the while aiming to create a fairly simple account and overview of the siege. After a few months of intermittent labour and despair I had succeeded in putting together a draft commentary which seemed to read fairly coherently. However, the Director/ Producer/ Editor/ Boss, although happy with my efforts, was left tearing his hair out (in a manner of speaking!) trying to fit visual images to the spoken word. It was an impossible task and in the end we agreed that the only thing to do was to make another visit to Vicksburg to get the footage we needed. I've heard some good excuses for taking a holiday, but "We've got to go and get more film." just about takes the biscuit. At last Dennis was confident that he now had enough film to put together a decent production. It was at this point that the really hard work began. In the weeks and months that followed I would be hard put to it to calculate the total number of hours he spent editing his work. Tribute must here be paid to the merits of non-linear editing on the DVC computer system. Its advent has made the whole process of editing so much simpler and easier than before and consequently there is much more scope for individual creativity. However, the fact remains that much of the merit of any production must lie in the care taken with its final presentation. Suffice it to say that when it comes to visual and aural fine-tuning, Dennis is obsessively perfectionist, settling for nothing less than the very best that he can possibly do. The end product of all these travails was finally ready in time to be entered for the SERIAC Film Festival which took place in Guildford in November 1999. The result was beyond our wildest dreams. The Siege of Vicksburg came second overall in the competition and carried off the Best Documentary and Best Sound awards. This was a very gratifying outcome after so much work and effort put in over a long period of time, but whatever the film's achievements, undoubtedly the most important thing for us both was the enormous pleasure and enjoyment we got in making it. Thanks to Brenda Mabey for the words and to Dennis for the frame-shots.